Tonight is Monday night. Not just any Monday night. It's GNO! Girls Night Out. For 3 years or so now, myself and a group of girlfriends have been going out on the first Monday of each month. I think in these three years, we've only skipped one month. My great friend, Rachael, recognized that if we didn't plan this night each month, we'd never get together. SO that is how our Girls Nights began. Necessity! 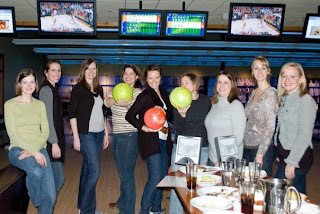 Here is a list of ideas for you if you want to have your own girls night out. Through the years, I've tried to find ideas on the internet and I thought they were kind of lame. Our ideas are so not lame. Chuckle. Each year we do a favorite things list. Each woman brings a list of 5 or so of their favorite things from the year. They also wrap one or two of the items up (new) and we do a grab bag! We spend no more than $10 on our item. It's so much fun to go around and find out what each woman likes. We've had lists that have contained restaurants to coffee drinks to eye drops. It's a great time. Once or twice we've brought our favorite recipes (enough copies for everyone) and passed them around. It's a fun way to give women new ideas for dinners! I think it'd be fun to bring our favorite dish to eat one night, too. When the weather is nice, this is fun. I stink, but whatever. We went bowling once. It was fun. If you are in the Chicagoland area, Pinstripes is the way to go. On Monday nights, they serve their bottomless salad and spaghetti and meatballs. Food and fun. 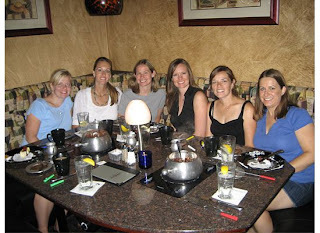 We've done chocolate fondue at the Melting Pot a few times. We've also gone to Ann Shea Chocolate Lounge in South Barrington. 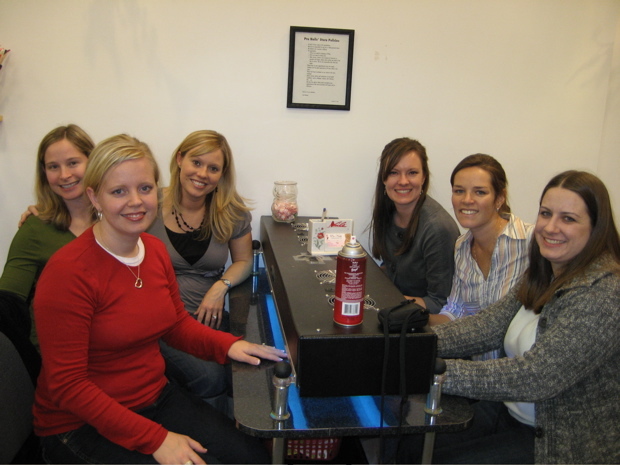 Very fun and perfect place for a girls night. There's a girly room with a fireplace where you can lounge and eat whatever fun treat you ordered. Highly recommended. My personal favorite ;) A few times we've had our friend, Lynda, lead us in Craft Night. She comes up with some fun, simple crafts for us to put together. 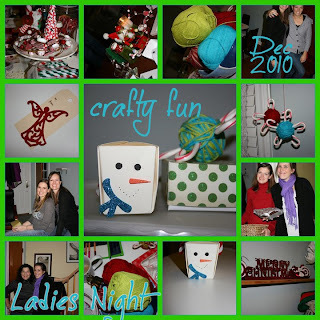 We did two around the holidays and made some really fun things. Everyone brought a dish to share and sat around creating fun ornaments, gift tags and gift boxes. Tonight is our second annual "all I didn't want for Christmas" exchange. We take a gift we've received for Christmas (our that our kids/husband received) that is not something we would like to necessarily keep. You know those gifts. The one I REALLY wanted to give was a gift we received from an unnamed recipient of a moose on a rocking horse singing "grandma got run over by a raindeer". My husband won't let me keep it. Anyway, we wrap this item and do a gift grab bag game. The person with the worst gift gets a bad prize. It's a lot of fun and a lot of laughs. If you have a large group, it's hard to converse, but on Monday nights you can usually squeeze a large group in. Months that we don't have an idea what to do, we go to trusty and delicious Cheesecake Factory for dessert. One of the GNO's I missed due to vacation was a free cooking demonstration at William Sonoma. Pottery Barn also offers free classes on decorating. Keep your eyes peeled! This was so much fun. We each bought a gingerbread house kit and decorated it. I don't remember how we judged it, but we sat around a huge table and laughed the night away. While writing this post and seeing the pictures, I again realize how blessed I am to be able to meet with these wonderful and godly women on a monthly basis! Love you ladies ;) See you soon! 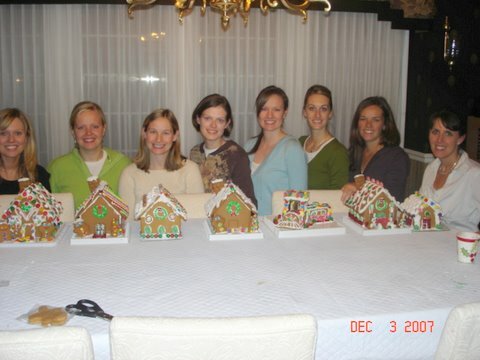 This was so funny to see us through the years. Especially watching our weights fluctuate up and down with each pregnancy!